When I was first diagnosed celiac back in the day I was told I needed to eat a lot of gluten for one week before an endoscopy could be performed to confirm the results blood test. Having avoided gluten since I got the initial diagnosis I looked on this as an opportunity to say a fond farewell to all the food I would no longer be able to eat and also to remind myself of how wretched they made me feel. On the list was proper crusty French bread, garlic bread oozing with mozzarella, pizza from DiFontaines, doughnuts and last by not least a chocolate éclair. There used to be a tiny pastry shop in the Epicurean Food Hall off Abbey St. in Dublin that made the most amazing little cakes, delicate mousse, cream and chocolate confections that were so luscious my sister would occasionally carry a box of them down to Cork as a treat for us at home. When I moved up it was a place I visited when I needed a bit of a treat as they had the most amazing chocolate eclairs, beautifully baked choux pastry tubes, topped with a chocolate glaze and filled with crème patisserie hiding a deep vein of caramel running the length of the cake. When I was told I could indulge in gluten one last time I made a beeline for this place only to find it had closed and I was absolutely bereft. It took me a ridiculous nine years of eating gluten free before I attempted my first chocolate éclair, I have ticked both profiteroles and gougeres off the list of successful gluten free choux pastry experiments and both had worked well but for some reason I was still a bit intimidated and when I finally decided to go for eclairs my fist two attempts were miserable failures. In one attempt I tried a slight variation on the choux pastry recipe I had used for my profiteroles but the pastry barely rose in the oven. The other recipe I tried produced pastry was almost liquid and ran off the tray before I could even get it in the oven. Having consulted a few of the hundred online instructions for making eclairs I found one that worked incredible well with GF flour. 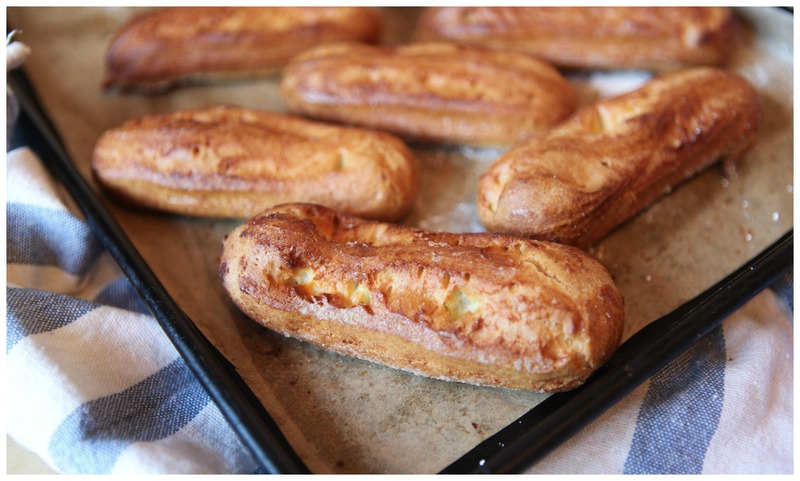 The full tutorial is on the website http://www.ironwhisk.com/2014/06/tutorial-eclairs-choux-paste/ and if you are new to working with choux pastry I advise you to check it out. 150g beaten egg, this took 3 medium sized eggs, I usually use large eggs which may have accounted for the very liquid pastry of my earlier attempt. Combine the water, milk, butter, sugar and salt in a heavy bottomed pot and bring to a strong simmer over a medium heat. Remove the pot from the heat and add the flour to the simmering liquid beating with a wooden spoon until the flour is fully absorbed. Return the pot heat and keep beating the dough for at least five minutes. At this point in the tutorial I was advised to check the temperature of the dough using a sugar thermometer and I did try but couldn’t really get that to work so I did a my Mum advised and beat for another two minutes or until my arm felt like it was going to fall off and there was a visible film of pastry on the base of the pot. At this point you can transfer the dough to the bowl of stand mixer fitted with a paddle rather than a whisk and beat on the lowest speed until the pastry cools down. If you have the upper arm strength you can do the same with a clean bowl and the wooden spoon. Once the pastry has cooled add half of the eggs and beat vigorously to combine, if you are using the mixer keep the speed on the lowest setting. Add the rest of the beaten eggs slowly while you continue to mix, if you feel like the pastry is getting too loose then stop, the pastry should be stiff enough to pipe through a pastry bag and hold its shape so you may not need to use all the egg. 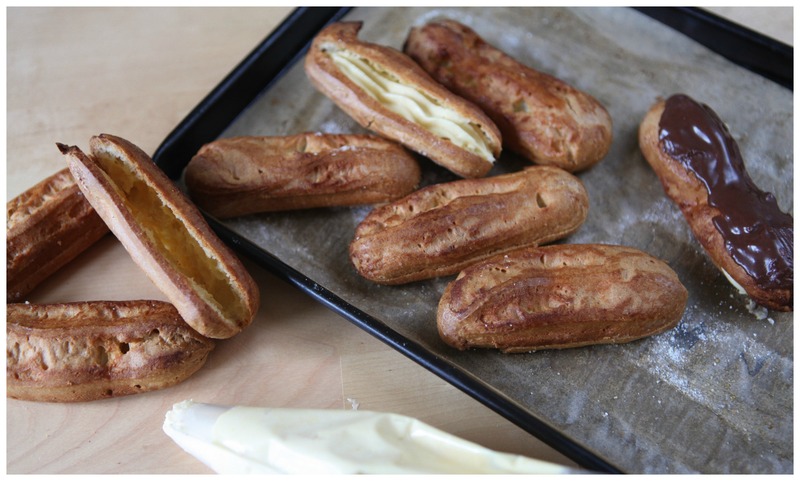 One you are happy with the consistency of the pastry you will be ready to pipe out the eclairs. Spoon the pastry in to a piping bag fitted with a ½ inch wide star shaped nozzle, I find the easiest way to do this is to balance the piping bag in an empty glass, my other tip her is to use a disposable bag, it makes the clean up a lot easier. 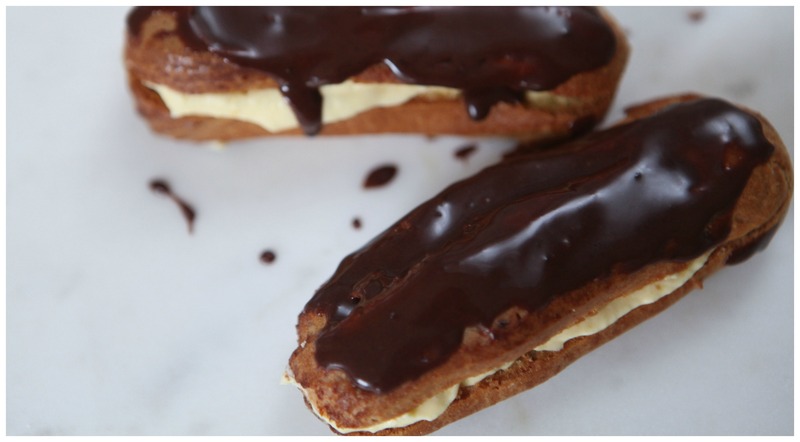 Pipe out the eclairs on to the baking sheet, you want the pastry to be about 1 inch wide and 5 inches long, leave about two inches between each éclair. Bake in the preheated oven for forty minutes until the ecalirs have risen and are a deep golden brown. 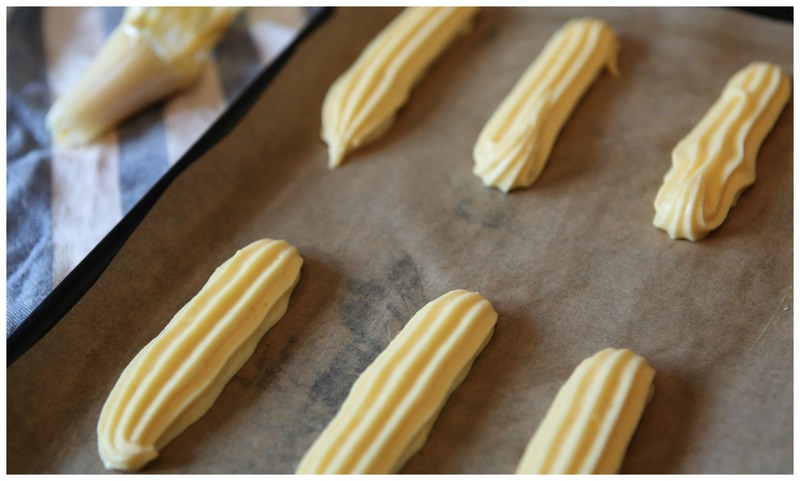 Remove the tray from the oven and pierce each éclair with a skewer or a sharp knife to release the steam this will stop the eclairs going soggy. Allow the pastries to cool completely before filling with your choice of sweetened whipped cream, crème patisserie or even a raspberry mousse, whatever you are inspired to try. 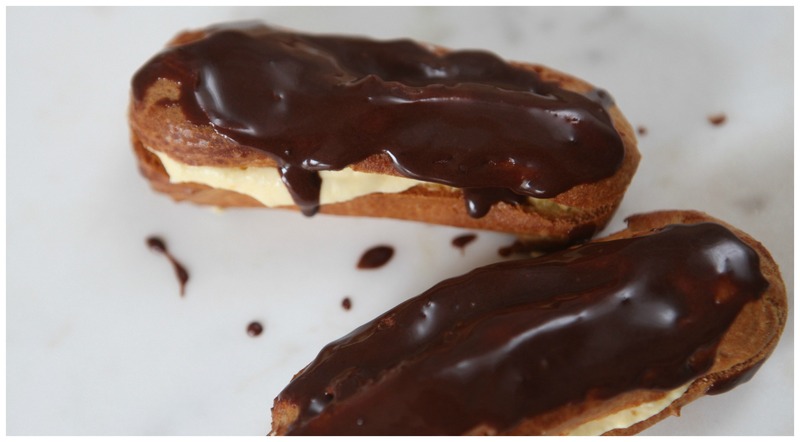 You can top the eclairs with melted chocolate, chocolate ganache or a simple chocolate glaze made from 1 cup of icing sugar mixed with 2 tablespoons of cocoa powder and enough hot water to get to a good consistency for coating. As I have said here before I sometimes get frustrated at the limitations that Gluten Free bakeries put on themselves or their insistence on conflating gluten free with healthy eating. I understand the desire to be healthy but I am more of an all things in moderation kind of person, if I want a treat I will eat a treat that satisfies rather than trying to recreate that treat without eggs, dairy, grains or sugar. If your diet is thus restricted than I absolutely support being creative with the ingredients you can handle but my body just can’t handle gluten and therefore when I want a cake I want something that tastes and feels like cake and often times the dry as dust, mealy textured offerings I get from bakeries make me just a bit sad. I want a sweet that feels indulgent so I know I have just had a treat and that is exactly what I get from these eclairs.